Natural pearls: All pearls are formed when an irritant works its way into a mollusk (an oyster, mussel, or clam). To protect its soft body, the mollusk coats the irritant with nacre, an iridescent material that also lines the inside of their shell. Over time, layers of this material build up, forming a pearl. A natural pearl is one where the irritant is accidentally introduced. These are extremely rare and correspondingly expensive. Cultured pearls: Cultured pearls are formed through the exact same process as natural pearls, the difference being that to make a cultured pearl, the irritant that forms the core of the pearl is deliberately inserted by a pearl farmer. 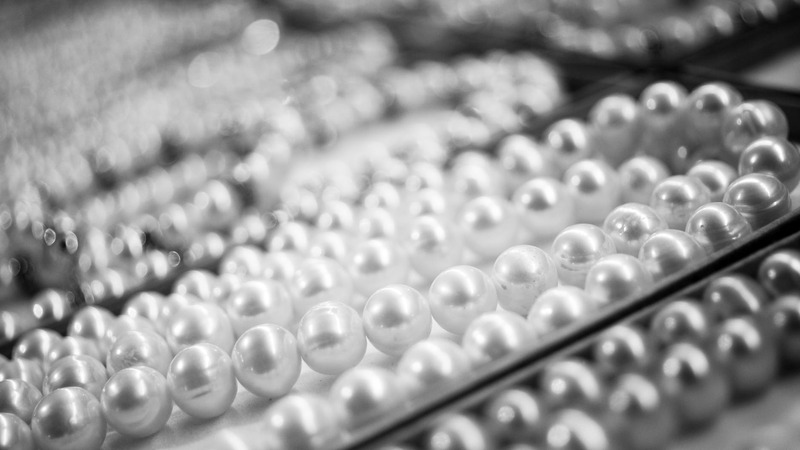 This process makes it possible to have greater control over the size, color, and quality of the pearls produced, as well as bringing the price to more affordable levels. Make no mistake, however—cultured pearls are not imitation pearls. They are just as real as natural pearls. Akoya (from Japan and China): These produce pure white pearls that range from 2 to 9 millimeters in diameter. Tahitian (from the French Polynesian islands): Tahitian pearls range from light grey to pure black, and average 9 to 13 millimeters in diameter. Many Tahitian pearls may be found in baroque shapes as well as perfectly round beads. South Sea (from Australia, Indonesia, and the Philippines): The largest pearls on the market, these can be white or golden and up to 15 millimeters in diameter. They have a unique satiny look due to their thick layers of nacre. Freshwater pearls: These pearls form in mussels that live in bodies of fresh water such as lakes or rivers. They can appear quite similar to saltwater pearls, and come in a variety of different shades. While most freshwater pearls are produced in China, they can also come from Japan or the United States. Baroque pearls: This term refers not to the origin of a pearl, but to its shape. Baroque pearls are irregularly shaped rather than being perfectly round, and their individual variation gives them a dramatic flair that has become quite popular in contemporary jewelry. Designers have been known to craft unique pieces to showcase particularly interesting baroque pearls. You can find gorgeous pearls for below-market prices at AuctionKing.com every day, from timeless strands of creamy white pearls to stunning golden South Seas or lustrous black Tahitian pearls. Every piece is accompanied by a gemological report verifying its authenticity, so you can bid with confidence. Register for a free online account today to find your next treasure. Previous PostPrevious Are Orange Sapphires Valuable?